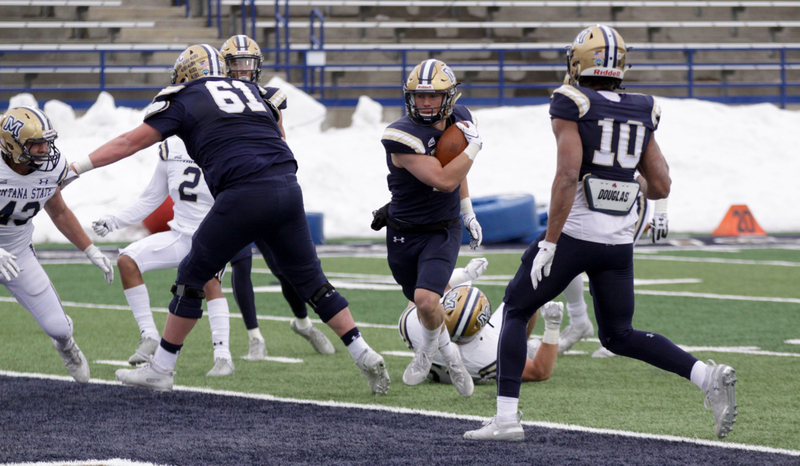 BOZEMAN, Montana — For the first time in recent memory, the Bobcat players beat Jeff Choate to the Montana State blockhouse for the post-football press conference. 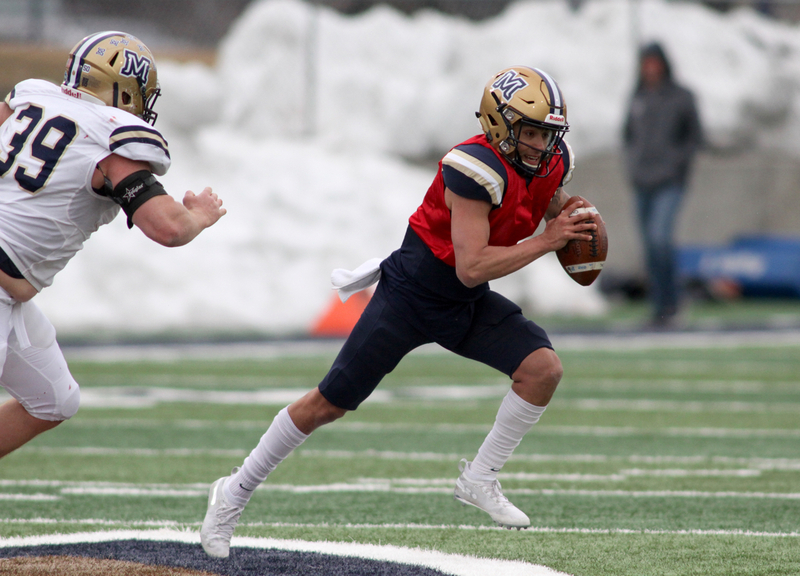 Choate had an operation on his knee less than a week ago, yet still coached in his demanding and high-energy style, albeit with a slight limp, for more than two hours during the Sonny Holland spring football game on Saturday afternoon at Bobcat Stadium. Senior captains defensive end Derek Marks and wide receiver Travis Jonsen sat down ready to address the media when Choate finally sat down. 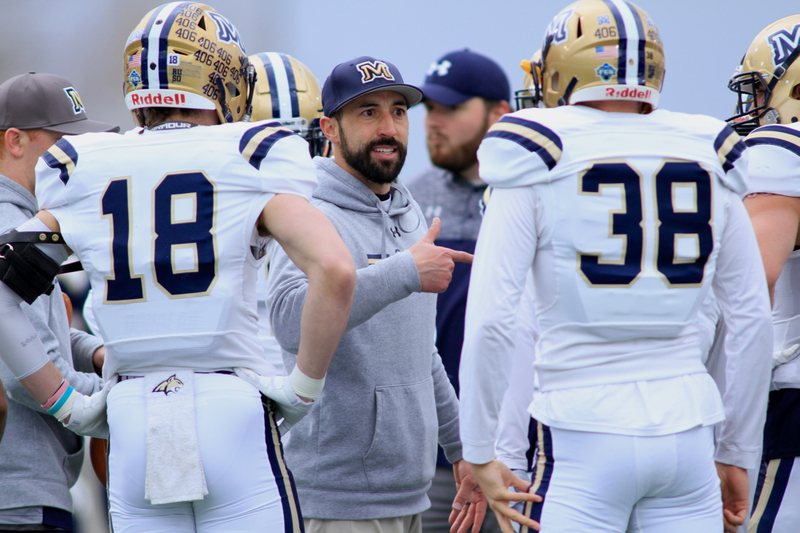 Montana State’s fourth-year head coach let out a long sigh, one indicative of finally getting off his feet. But the significance of the sigh could also be taken as a sigh of relief. The Bobcats are just happy spring football is finished. “I think somebody just asked me what was memorable today and I said, ‘The wind. That was memorable’,” Choate said. “That was really pleasant spring ball. 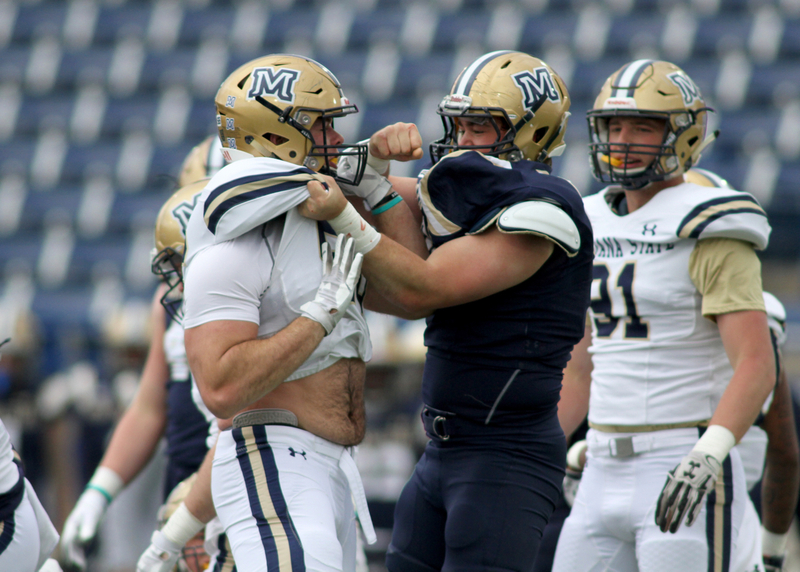 When Choate took over as the head coach, he began implementing a culture of toughness and family, the former honed in a pair of brutal and taxing fall camps and sessions of spring drills. But the first fall camp under Choate saw an array of players lose significant time because of season-ending injuries. 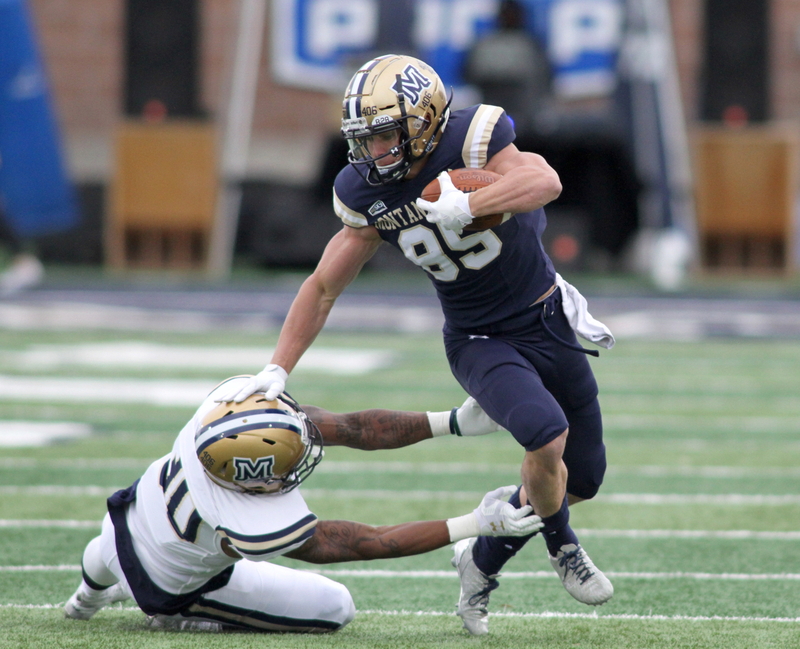 The following spring, several Bobcats, including standout linebacker Jacob Hadley, again suffered season-ending injuries. The Bobcats will have a clean up practice on Tuesday, polishing a few details and implementing their player-run practice schedule for the summer. — On the second play of the non-situational part of the scrimmage — one throw after launching an errant throw that nearly went into the stands because of the strong wind blowing from the Northwest to the Southeast — sophomore Tucker Rovig lofted a second straight deep bomb to a streaking Travis Jonsen. 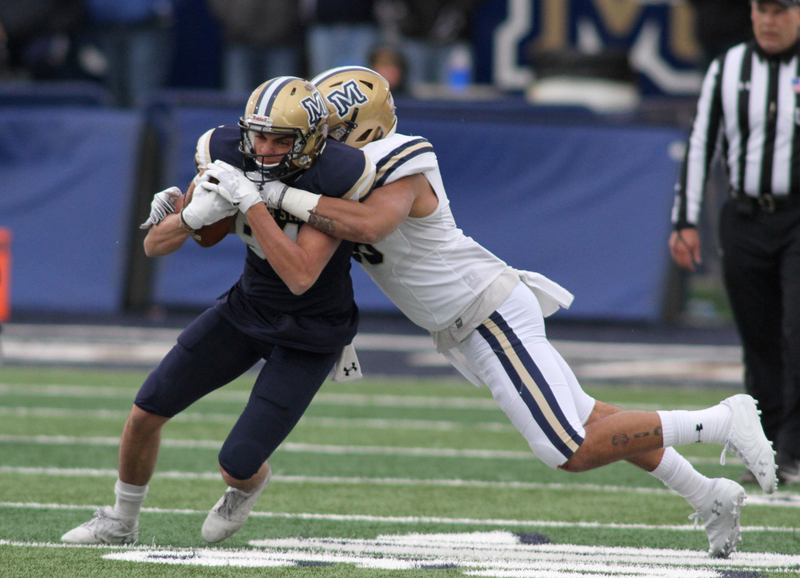 Although the blustery conditions made the ball spin funny and made the pigskin float, Jonsen showed his unbelievable athleticism, stopping on a dime and making a leaping catch while falling backward for a 53-yard gain. A few plays later, sophomore Isaiah Ifanse pounded in a short touchdown, his first of two bruising touchdown runs on the afternoon. — Late in the scrimmage with the starters and reserves mixed and matched, Rovig hit senior Kevin Kassis on a shallow drag. 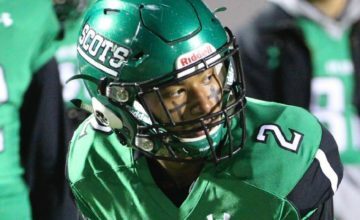 The shifty, chiseled senior captain did the rest, stiff arming a defender, showing his speed and gaining 35 yards into the red-zone. Two plays later, Shane Perry punched in a touchdown from six yards out. — Logan Jones, a fourth-year senior a year ago who missed most of the season with an injury before playing in the newly allotted four games, took his redshirt, did not participate in MSU’s two playoff games last season. In his fifth year, he has shown elite explosiveness, particularly in small spaces, just like he did on a dancing dash for a 25-yard gain on Saturday. 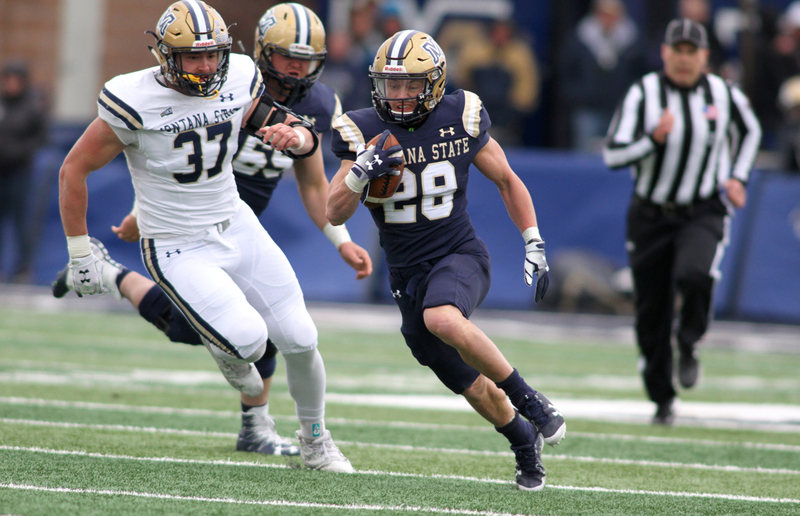 — During the red-zone period, Ifanse — a squarely built 5-foot-10, 190-pound powerhouse who became the first Bobcat to rush for 1,000 yards in a single season as a freshman — bowled over at least three MSU defenders on the way to an impressive six-yard touchdown. 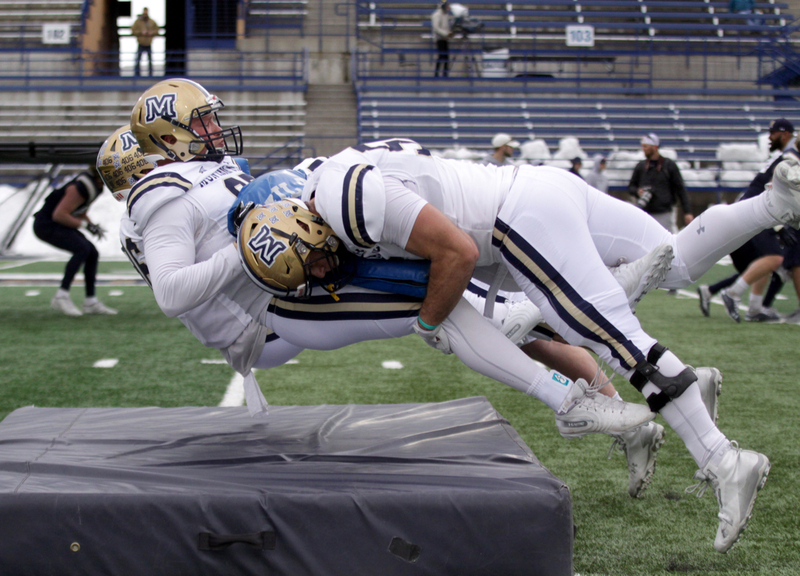 — Marks and senior Bryce Sterk shared a sack-strip on redshirt freshman Casey Bauman that junior defensive tackle Chase Benson recovered for the lone takeaway on the day. 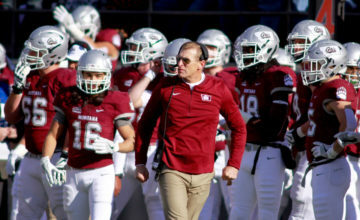 — Level Price Jr., a 5-foot-10, 170-pound redshirt freshman from Los Angeles, California who joined MSU as a preferred walk-on out of St. John Bosco Prep, missed most of his first season last fall with an injury. On Saturday, he had his most noticeable day in a live session with the Bobcats. He came off the edge for a pair of sacks on cornerback blitzes. He also had an impressive break on a Rovig pass that nearly resulted in an interception. — With Gregory “Munchie” Filer III slowed with an undisclosed injury that has kept him in a red non-contact jersey for most of spring football, sophomore Jalen Cole not currently on the roster after suffering a head/neck injury last November and redshirt freshman Ty’Rese Gibson not currently on the team, Price took significant repetitions with the second-team defense. And senior safety JoJo Henderson took reps at corner as well. 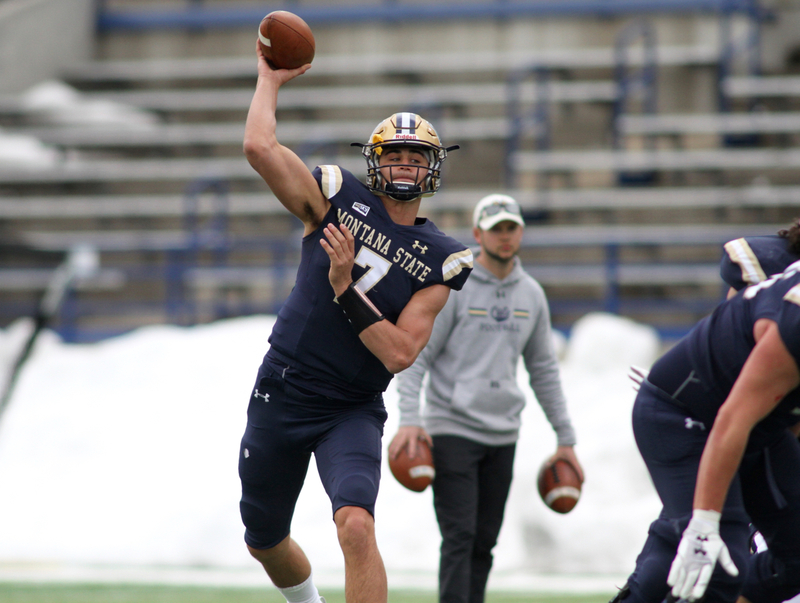 — Rovig took the majority of first-team repetitions at quarterback. Both Choate and Jonsen said the 6-foot-5 sophomore had the best command of the offense. — Senior kicker Tristan Bailey attempted two 42-yard field goals into and against the side-blowing wind. Both field goals missed REALLY wide right, which earned sympathy for Bailey from his head coach. 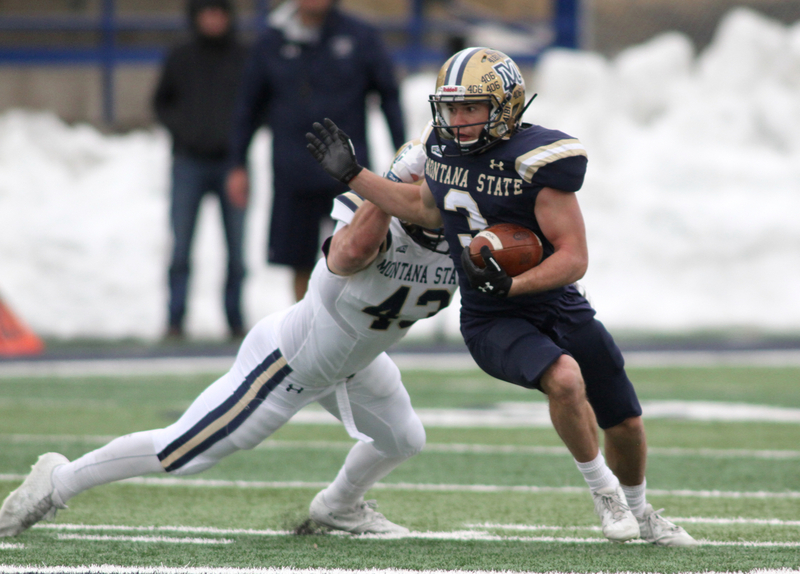 — Sophomore Callahan O’Reilly, a converted quarterback from Bozeman High School, continued showing his improvements playing inside linebacker. 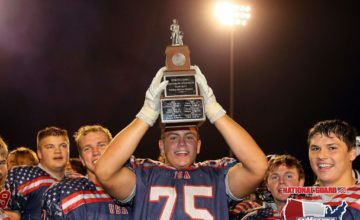 He had three impressive solo tackles in the hole in which he translated the strength that has linebackers coach Bobby Daly calling him one of the strongest pound-for-pound players on the team. 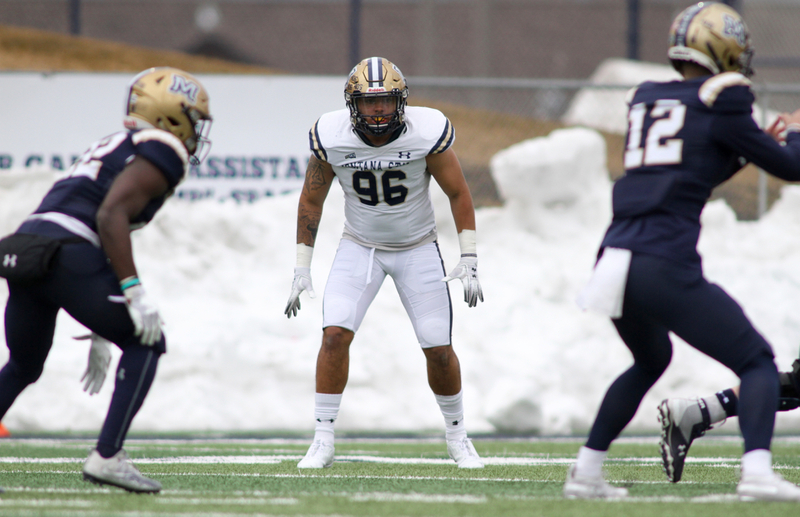 — With senior Josh Hill and junior Chad Kanow on the shelf, O’Reilly, redshirt freshman Nolan Askelson and senior Walker Cozzie took the majority of the first-team snaps at inside linebacker. 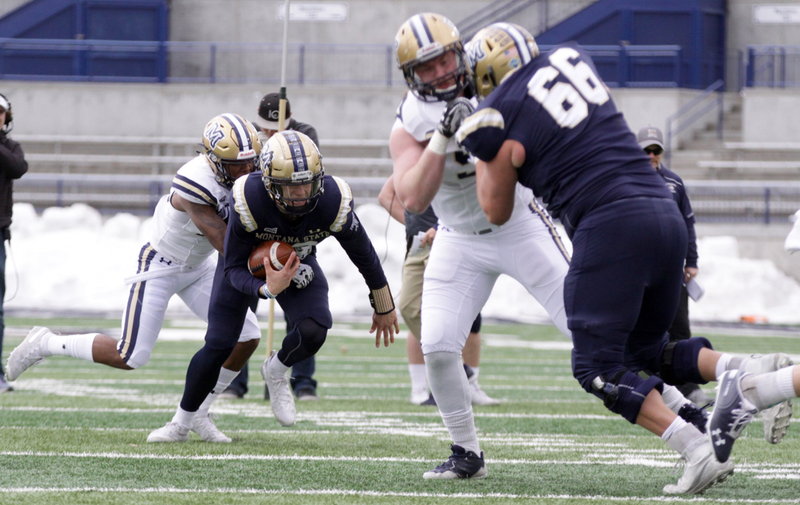 — Junior Kyle Finch had a sack during a period later in the scrimmage in which the reserve defensive front seven more than held its own against MSU’s top offensive line. Redshirt freshman Seer Deines and sophomore Kyle Rygg anchored the inside of the second defensive line. 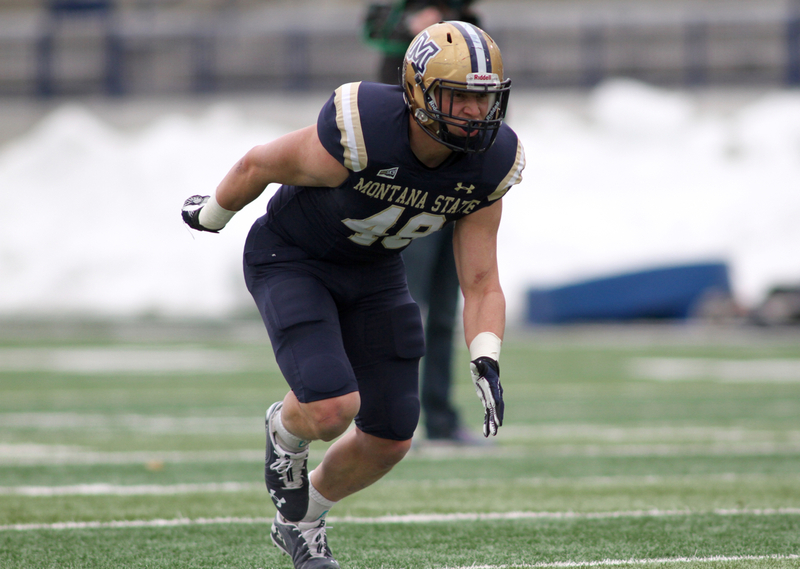 Rylan Wilcox, a redshirt freshman former walk-on from Missoula Big Sky, played the end opposite Finch with that unit. — Junior guard Taylor Tuiasosopo, who missed MSU’s first scrimmage, returned to action but mostly played with a second offensive line that also featured redshirt freshman Ryan Barkley at left tackle, redshirt freshman Ethan Ormes at right guard, sophomore Denver Krone at center, and redshirt freshman Joey McElroy at right tackle. 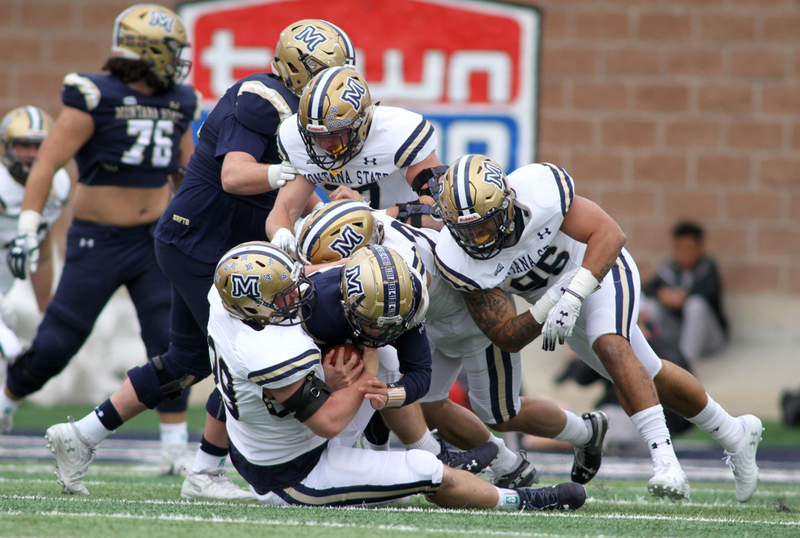 — In Tuiasosopo’s place on the starting offensive line, junior Jake Sessions played left guard with senior Mitch Brott playing left tackle, sophomore Zach Redd playing center, junior Lewis Kidd playing right guard and sophomore Connor Wood playing right tackle. — Washington transfer Amandre Williams showed his versatility, lining up at both end spots as well as Sam linebacker during Saturday’s scrimmage. Choate has also said that the 6-foot-2, 248-pound junior will have a role on offense. 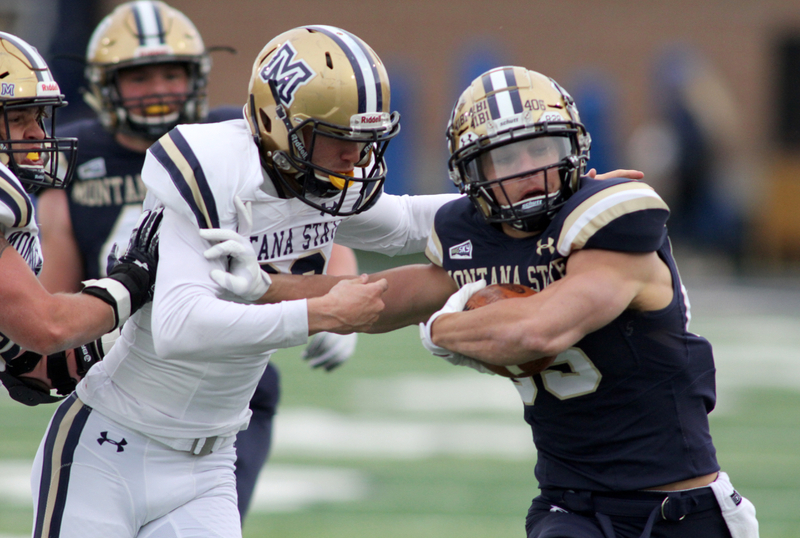 — Senior Marcus Ferriter, the only Butte native on the Bobcat roster, had several tackles, including a tackle for loss. 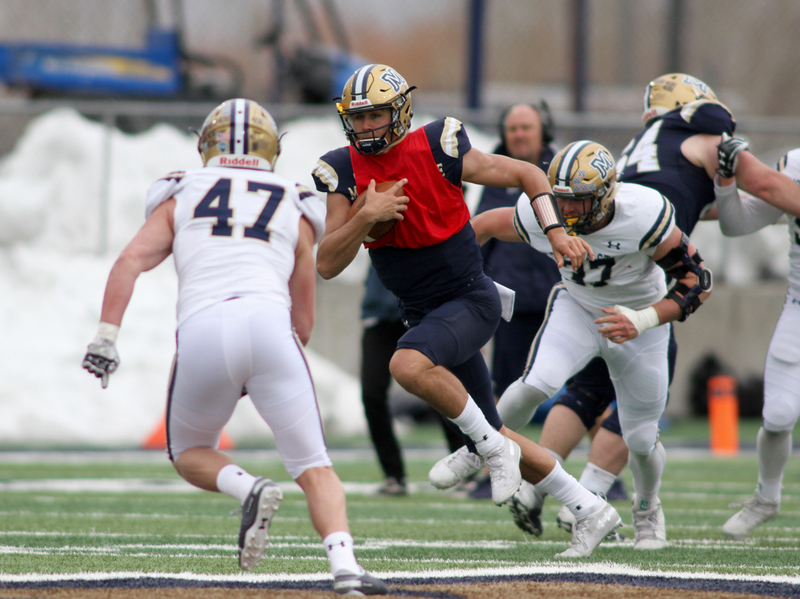 — Cole, Hadley, junior linebacker Troy Andersen, senior wide receiver Jabarri Johnson, sophomore fullback R.J Fitzgerald redshirt freshman linebacker Jory Choate, sophomore defensive back Keaton Anderson and redshirt freshman tight end Treyton Pickering did not participate on Saturday.